It's not always possible to take a nap or turn in for the evening when you start to get sleepy, but luckily, there are a number of different strategies you can use to try to keep yourself awake. While not every option works for everyone in every situation, there are probably a few solutions that will work for you when you need to keep sleep at bay. People who work in desk jobs may find that a sedentary lifestyle doesn't contribute to staying awake on the job. Web MD recommends getting up and moving around as a natural way to help you fight sleepiness in such situations. If you spend hours in front of the computer, try to get up and move around at least once an hour for about five minutes. If your job doesn't let you move away from the computer, standing up and walking in place is a good way to go. By moving around, you are increasing circulation, stimulating muscles, raising your heart rate and respiration, and telling your body it needs to be active. Light exercise helps you stay awake, as demonstrated by a study presented at the Associated Professionals Sleep Society annual meeting in 2009, as reported by The Telegraph. It stimulates your heart rate, respiration, and circulation. If you're about to pull a late night or an all-nighter studying, spend 30 minutes exercising. Cardio-based exercise (walking, running, biking, swimming, and dancing) is one of the better ways to rev your engines, stimulate your mind, and keep you awake. Men's' Health recommends aerobic squats and forward bends to help stay awake while driving. People who exercise in the early morning before work generally feel more alert and active throughout their day. When trying to stay awake, most people reach for sugar and caffeine. Heavy doses of coffee, cola, or super-sweetened drinks can wake you up and even provide you with temporary boosts of energy. The problem is that they have only short-term positive effects. According to NutritonResearchCenter.org, you'll experience a high rate of "crash," particularly from sugary products that contain caffeine. This can make you even more tired than you were. Long term use of stimulants to wake up and stay awake can also become habit forming and result in severe headaches when you don't have your morning coffee or regular doses of caffeine. According to the Mayo Clinic, many health problems can result from consuming more than four cups of coffee per day, including insomnia, restlessness, fast heartbeat, irritability, and more. Caffeine is also a diuretic and can dehydrate you if you don't drink enough water. Anyone driving cross country and drinking high dose caffeine sodas to stay awake will discover that the alertness is counteracted by the frequent stops to urinate. 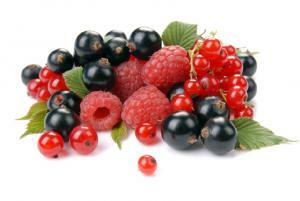 Eating fresh fruit and berries can help you stay awake. This is because fresh fruit contains natural sugars, higher water content, and basic fiber, all of which are sources of energy. According to Fitness Magazine, fruit is a great source of energy that won't result in a crash, as would occur if you ate candy or drank a sugary beverage. If you are trying to stay awake, it is important to avoid overeating and consuming particularly heavy meals. You should also avoid eating significant amounts of foods that make you sleepy, including turkey, dairy and whole grains, and any other items that are high in tryptophan. The Sleep Foundation explains that eating carbohydrate-heavy foods paired with foods that have a lot of tryptophan contributes to drowsiness. Some people believe that popping a bit of peppermint gum or candy in your mouth is another way to keep yourself awake, believing that the strong flavor and smell of the peppermint will keep your senses sharp. However, the sugar in gum and candy can help contribute to tiredness. According to WellnessDoctor.com, inhaling peppermint oil may be a better choice, suggesting that inhaling the fragrant substance can contribute to energy, as well as to alertness and focus. Many people experience sleepiness when it's extremely warm. Turning the temperature down and making it a little chilly can also help you stay awake. Opening your window to cold air or turning on the air conditioner in your car when you're driving can help you wake up; this technique is even recommended by the State Farm Learning Center. Splashing cold water on your face, hands, and wrists can also have an anti-sleep effect on you, but cold water splashing is not a long term wake up solution. According to the UCLA Semel Institute for Neuroscience and Human Behavior, bright light makes it easier for people to stay awake, and also has antidepressant qualities. By turning on some bright lights, you can help to stimulate your mind and therefore help to avoid falling asleep. You may even want to consider using a Feel Bright Light, physician-engineered product designed specifically to help you feel more alert and awake during the day. You can also head outdoors and allow the bright sunlight to help improve your sleepiness. You've heard the phrase "laughter is the best medicine" many times. When in comes to keeping yourself awake, that just might be the case. According to Active.com, laughing is a natural stimulant for the body and the mind. Watch a funny movie or video, or read a funny book or comic strip. You have to stimulate yourself to actually laugh for this method to work. Of all the ways to stay awake when you need to be up and alert, the most effective is to be sure to get enough sleep on a regular basis. According to the American Psychological Association, 40 percent of those who have trouble sleeping experience excessive daytime sleepiness to the degree that it interferes with their daily activities. If you are having trouble sleeping, learn what to do when you cannot sleep. Follow these tips for a better night's sleep to help improve your ability to fall - and stay - asleep when it's time to rest. If you are experiencing signs of a sleep disorder, see your physician or a sleep specialist for diagnosis and help. Taking steps to ensure that you get plenty of rest is something that everyone should do. Even so, you're sure to start to feel sleepy at inopportune moments from time to time. Experiment with these tips the next time you need a bit of help staying awake to discover what works best for you.